ArcGIS for Server supports the full livestock chain (breeders, veterinarians, brokers, industry, police, etc.). GIS helps keep track of 11.5 million livestock with individual electronic identification. The web portal, used for cattle trading and managing sanitary zones, was built with ArcGIS API for Silverlight. Result of two distance searches for neighboring lands of a farm. A sanitary emergency is one of the possible uses for this tool. In the picture, neighbors pertaining to the first ring are shown. Note that when a farm has lands within the red ring, all its parcels are shown, even if they fall outside the ring. Uruguay is a small country of three million people and more than 11.5 million livestock. Eighty-five percent of its surface area is devoted to grazing. The quality of its livestock and its exceptional sanitary conditions, as well as its derived products, have allowed the country to earn a place among the major exporters of the world. The Ministry of Livestock, Agriculture and Fishery (MGAP) of Uruguay created the National System of Livestock Information (SNIG), a multipurpose system that gives support to operational and strategic decisions for this important branch of the economy. SNIG was developed for tracing livestock. This traceability system, which is compulsory and has national scope, encompasses more than 75,000 participants in the agricultural and industrial sectors, including all the breeders, intermediaries, livestock auction locations, and slaughter plants in the country. 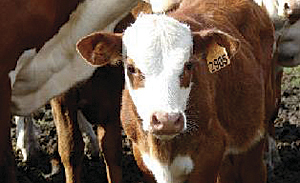 In a gradual process that began with the individual radio frequency identification (RFID) and registration of all calves born after 2006 and culminated in July 2011 with the identification of the rest of the livestock population, SNIG incorporated more than 11.5 million animals in its database, making Uruguay so far the only country with full livestock population traceability. Each livestock transaction, both by transportation and ownership change, must be preauthorized and recorded in real time. This allows SNIG to receive information about 350,000 operations carried out annually, verify that the actors are registered and do not have any sanitary or legal prohibitions, and establish and register the origin and destination of each movement. This information is stored in a centralized database and managed through a web portal either from different offices of MGAP distributed throughout the country or from the farms, possible because most of the country has 3G/GPRS coverage. 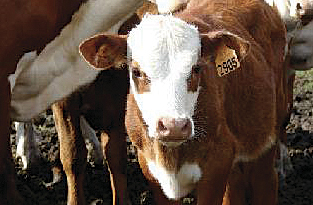 A traced calf, showing the RFID tag. In short, this allows SNIG to store updated data on each bovine animal in the country—who the owner is, where the animal is, where it was, and if it was in contact with other animals—from birth until it is sent to slaughter. 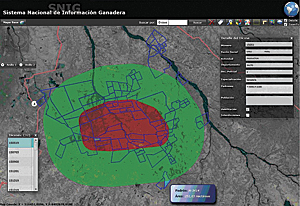 SNIG was designed by a consortium of companies, including Ingenieros Consultores Asociados (ICA), a GIS company and Esri international distributor. ArcGIS for Server was chosen as the technology platform because it provides the functionality to handle a significant amount of data that can be easily integrated in web solutions of the system. 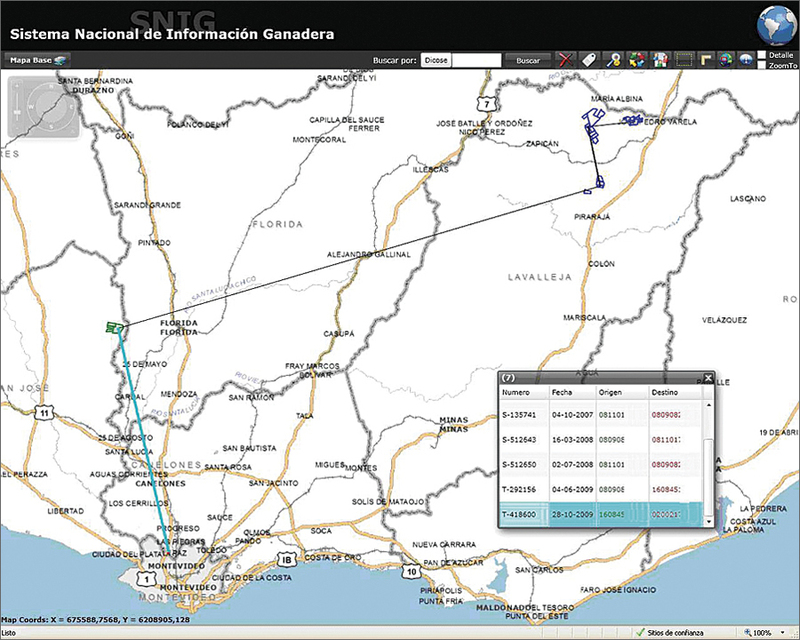 ArcGIS API for Silverlight 2.1 proved to be an excellent development platform for this application. In other words, for the huge volumes of data involved, ArcGIS for Server was the perfect solution due to its horizontal and vertical scalable architecture. To obtain geographic data providers, agreements were established with the Uruguayan Spatial Data Infrastructure Commission and other institutions. 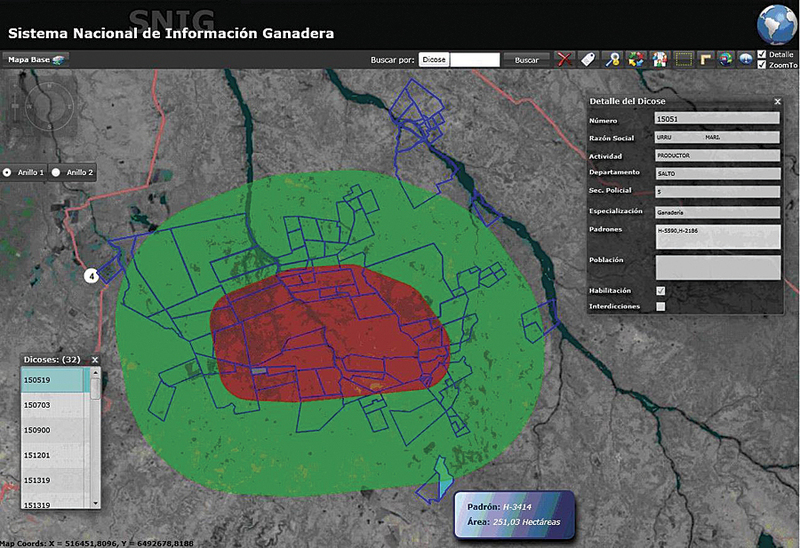 The General Directorate of the National Cadastre provides GIS information for 200,000 rural parcels. 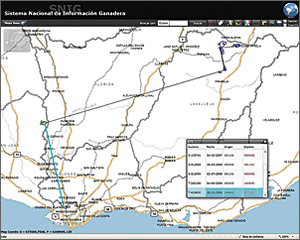 Additionally, the Ministry of Transportation provides GIS information concerning roads, administrative divisions, locations, and 20 other layers of reference. Path of an RFID-identified animal. Each line segment shows a different transportation of the animal. The developed web application gives different involved actors (breeders, brokers, industry, veterinarian services, police, etc.) information related to their activities, providing transparency to the system. Each participating actor has different privileges that give authorized access to distinct data and functionality. For example, breeders may access maps of their farmlands and data on activities or animal species through their respective registration numbers. Veterinarian services may access maps showing rings of neighboring farms, data used in case of animal diseases. The quality of services and increasing development have enabled SNIG to fulfill an important role in the construction of an integrated vision from both external and MGAP information systems. Pablo Rebufello works for ICA as a software development manager and GIS specialist consultant. He is also a professor of GIS at the University of República Oriental del Uruguay. Pablo Piperno is an architect with a degree in information systems. Gustavo Drets is a senior GIS consultant at ICA. For more information, contact Pablo Piperno (e-mail: ppiperno@ica.com.uy) or Gustavo Drets (e-mail: gustavo@ica.com.uy) or visit www.ica.com.uy and www.snig.gub.uy.